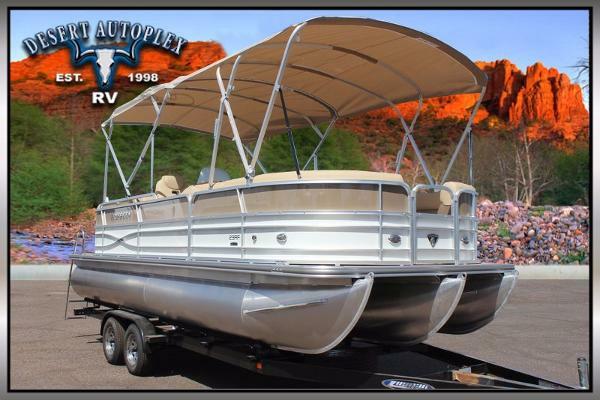 2015 Stingray 192 SC DECK BOAT wTrailer 20Ft 192SC Sport Deck Boat that will blow you away with all of the factory stock options. Powered with the all new Mercury 115 hp four stroke that is much lighter & stronger with less maintenance. 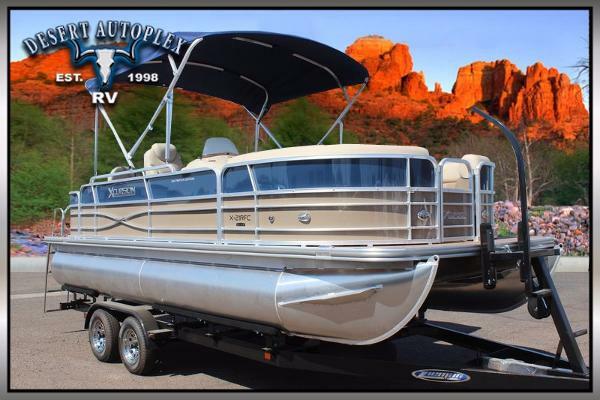 Loaded with plenty of standard factory options the 192SC is a great value as well, she comes with the Exclusive Z-plane Hull, Bow Anchor Storage, Bow Storage, Cooler/Storage Box with Drain, Floor Storage, Tinted Windscreen w/ Quick Release, Stainless Steel Aft & Bow Ladder SS Spring Line Cleats, Driftwood Trim Package, Hi-Power Bluetooth Marine Audio System w/MP3 Port w/4-S/S Speakers and Molded Deck Steps on Port Side Other Added Options: Italian Steering Wheel w/Tilt, Snap in Cockpit Carpet, Bimini Top, Digital Depth Finder w/ Depth Alarm, LED Cockpit Lighting, Freshwater Wet Bar. 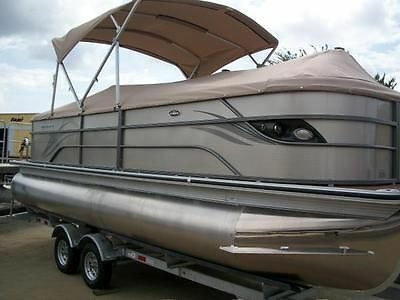 S/S Package; 11-SS Cup Holders, SS Rub Rail Molding & SS Bimini Top Quick Connects. Includes a Heritage Custom Matching Tandem Axle Trailer w/Brakes,Chrome Wheels & Swing Tongue Hitch. 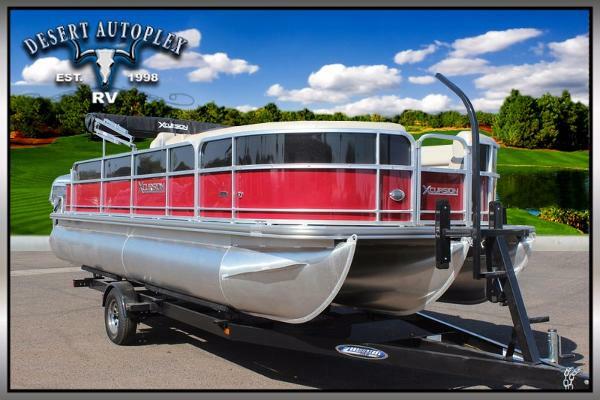 - 2015 SPORT DECK BOAT - mercury 115 hp - 11-S/S Cup Holders, S/S Rub Rail, S/S grab Handles, Deck: Bow Storage, Cooler/Storage Box with Drain, SS Spring Line Cleats, Cockpit Backlit instrumentation & Ckt breakers Integrated Electric Horn Premium Stain Resistant Vinyl, Helm Bolster Seat, Driftwood Trim Package, Throttle-Trim Control w/ Safety Switch,Fiberglass Cockpit Floor Liner, Fire Extinguisher Holder Insert , Engine: Power Trim and Tilt. 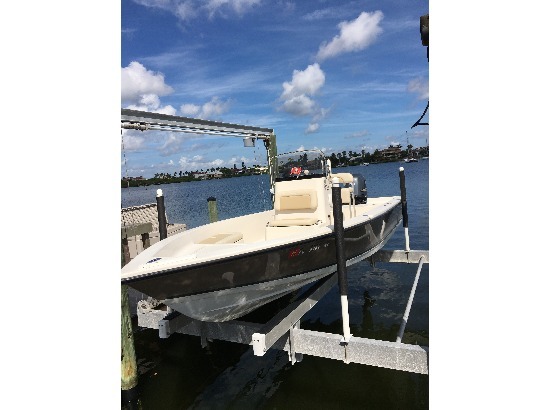 1977 Lund 18 foot Pike Deluxe •70 Hp Johnson outboard motor (1977) •Console steering •Power tilt featuring new actuator •Minnkota Power Drive bow mount trolling motor (50 lbs. thrust) allows operation from bow or driver seat. •New Humminbird fishfinder/GPS - 597CI HD combo. 5 inch screen features built in mapping, SD slot for mapping software, dual beam sonar coverage, and split screen GPS lake topography/fishfinder. •New anchor mate winch system for operation from driver’s seat •New 2 battery on board charging system, includes 2 marine batteries •New electrical fuse block and wiring •New live well aerator pump •New marine speakers and weatherproof stereo case •Removable quick release stereo with MP3 connection port •New bilge pump •Swim ladder •Covered bow storage with locking hatch •2 locking rod lockers •New boat cover •Docking light on bow enables easy landings at night. •Fresh interior paint& carpet •New 12volt cigarette lighter/charging receptacle on dash Shoreline Trailer •Drive on roller trailer with lifetime Minnesota license •New tires •New bearings •Wheeled trailer jack •Spare tire •Fits 2 inch trailer ball This fish and ski set up is a great all around boat that is perfect for small or large bodies of water. There have been many upgrades installed over the past year to maximize reliability and functionality. The mechanical systems have been thoroughly gone over and the electrical system has been completely rewired. The trailer has new tires, bearings also. 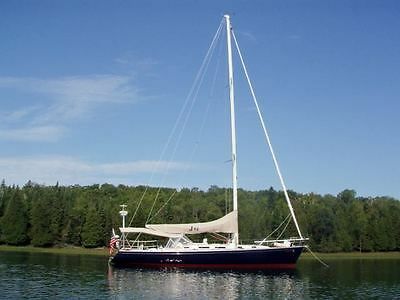 The high sides with wide gunnels make dockside entry easy, as well as safe when heading out to off shore destinations. 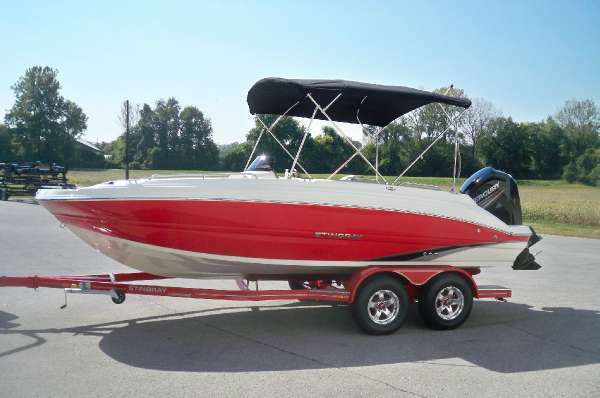 This boat handles well on big lakes as well as smaller lakes too. The covered bow compartment with hatch allows dry and secure stowage of lifejackets and gear. There is additional storage under the rear platform. A fourth seat may be added to the rear platform or is otherwise useful as configured for casting and exiting the water via the swim ladder. 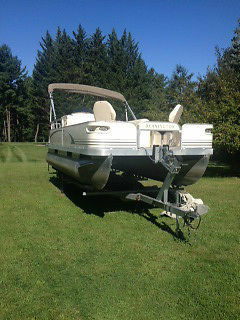 The outboard engine runs great and has more than enough power for this boat to easily pull riders behind. The bow mount trolling motor is easy to operate and is powerful enough to keep you on the fish in windy conditions. The onboard 12 volt 2 battery charging system can charge both batteries simultaneously and allows for easy charging without having to remove the batteries. The batteries also have a new gauge mounted on the dash to monitor their charges. The stereo system is easily removed by a pull handle to prevent theft, has an MP3 port, and features new speakers which sound great. You can also charge your electronic devices via the 12 volt receptacle on the dash. The new Humminbird 597CI GPS and fishfinder allows you to accurately navigate and quickly find the fish you’re looking for! 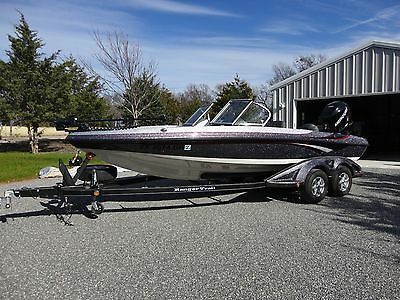 2014 RANGER BOAT 212LS LIKE NEW! LOADED! 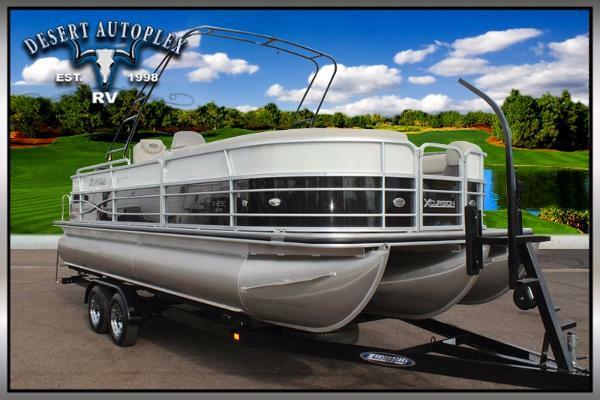 BRAND NEW 2015 Avalon Eagle 1670 Pontoon Boat. 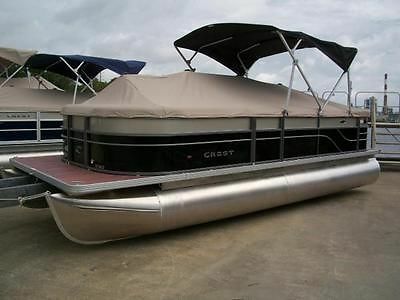 America's economical compact luxury pontoon! You and your family/friends can take the stylish Avalon Eagle anywhere. 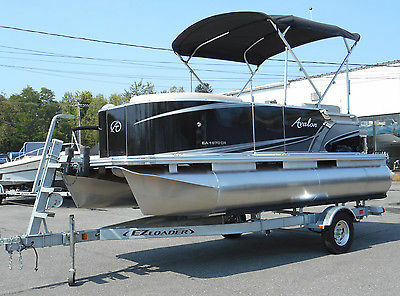 Includes a 5 year bow-to-stern factory warranty PLUS Limited Lifetime flooring, pontoon weld and seat frame warranty. Please contact us for warranty details. SPECS: Length : 17'5"/5.31 m Deck Length : 16' Dry Weight : 1,350 lbs. Max. Weight Cap. 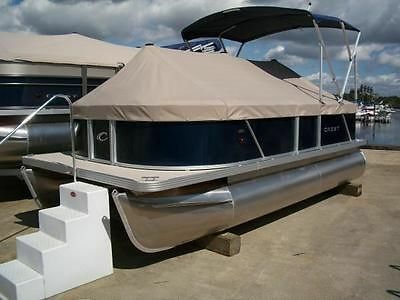 : 1,380 Pontoon Diameter : 23" Max. Engine H.P. : 50 Max. No. Persons : 6 Max. Persons lbs. : 950 Width : 7' Hours: 0 STANDARD FEATURES: Construction & Appearance 2" Rub Rail with Black Rubber Insert 2" U Bar Channel Crossbeams Deck Corner impact protection - Aluminum Deco 4 External multi panel walls Black Walls Flat Graphic Logos Flow-through Ventilation Lifetime Aluminum Seat Frames Pontoon Heavy duty Risers Square Front Deck Taupe Vinyl Flooring Buckskin Vinyl Interior Chrome Package Convenience & Amenities 4 Stainless U bolt & Cleat Combo Gate with Lift-n-lay Latch Ladder - Rear Starboard Aluminum Helm & Stereo (2) Stereo Speakers Black Soft-grip with Chrome Spokes Steering Wheel Cadet Fiberglass Helmstand & Dash Panel Millennia MILPRV21 Stereo Tach, Volt, Fuel Gauges Windshield Interior & Exterior Lights Courtesy Light on Helmstand USCG Navigation Lights Performance & Steering Steering - Mechanical Tilt Top/Enclosure/Cover Anodized Quick Release Bimini Mount Bimini Top w/ Square Anodized Aluminum Frame Seat covers Motor: Suzuki 25hp 4-Stroke Power Tilt/Trim Trailer: EZ-Loader trailer w/ steps included Please call (508)791-4917 with any questions. We ship worldwide. 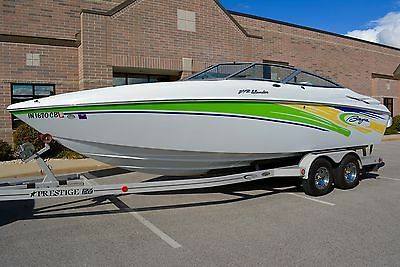 Model 242 Islander W/496 HO Mercruiser INCREDIBLE SHAPE!